The School is named "VIVEK" after a house of an ancient Buddhist University in Nalanda . It means discernment, judgement and enlightenment, which are qualities foremost in our minds at the school. VIVEK HIGH SCHOOL, For more than the last two decades, has progressively marched forward with an undaunted will in the name of education. Amidst our never ending journey, we have strengthened characters, ignited minds and glorified many a future on our way. VIVEK HIGH SCHOOL , where Knowledge imparted, next to virtue truly raises a Vivekite above the ordinary! ‘Vivek’, means the power of discernment. By making innumerable students capable of showing keen insight and good judgement, we have successfully conformed to our motto of Knowledge and Integrity. 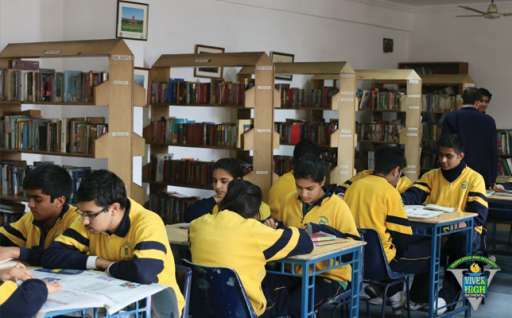 OUR MOTTO IS"KNOWLEDGE AND INTEGRITY"
The aims and ideals of VIVEK HIGH SCHOOL are to provide education for boys and girls from Classes Nursery to XII as per the Central Board of Secondary Education (CBSE), New Delhi. The early years of the child's school life are of utmost significance. These are formative years and the foundation of his/her future. Besides teaching, Reading, Writing and Arithmetic,we focus on the 4th R- Relating.our aim is to develop in our children a love and interest for learning, a healthy curiosity, love of books, correct study habits and to instill in him/her an understanding and appreciation of the beauty in Art, Literature, human relationships, moral values, producing a whole and balanced human being. We guide children to face a changing, tougher world, and aim to produce good, happy, healthy, well adjusted, morally sound children. Special care is taken to inculcate discipline so that it becomes a child's way of life. We also develop in the child the cultural ethos of our country. Specialised instruction in advanced subjects is given to the students by experienced and qualified teaching faculty. The entire curriculum of Vivek High reflects its philosophy and ethos. The accent is on the improvement and not only the achievement of set standards. The various activities in the school encourage an all-round development of traits, which would stand the students in good stead in later life irrespective of whichever profession they choose. In the words of the Principal, "The world is a mix of rainbows and dark clouds, of opportunities and pitfalls, of streaks of silver in grey areas and a host of other permutations and combinations. If every child has imbibed the essence of 'Vivek' he goes forth, into the wide world, confident with the knowledge that when choices are laid before him, he will make the correct one." The School is named "VIVEK" after a house of an ancient Buddhist University in Nalanda . It means discernment, judgement and enlightenment, which are qualities foremost in our minds at school. VIVEK HIGH , over the last two decades, has progressively marched forward with an undaunted will in the name of education. Amidst our never ending journey, we have strengthened characters, ignited minds and glorified many a future. At VIVEK HIGH , Knowledge is imparted next to virtue, and this truly raises a Vivekite above the ordinary! ‘Vivek’, means the power of discernment. By making innumerable students capable of showing keen insight and good judgement, we have successfully conformed to our motto of Knowledge and Integrity.